That looks delicious. Over medium eggs with a bit of warm yolk poking through and topped with fresh cracked black pepper. Add the pork sausage and that is indeed a marvelous way to break your fast. You have to eat it fast before the yolk gets cold on days like these! Yes, indeed. Yay for eggs! OK, I’ll be *that* guy and say it all looks overcooked to me. 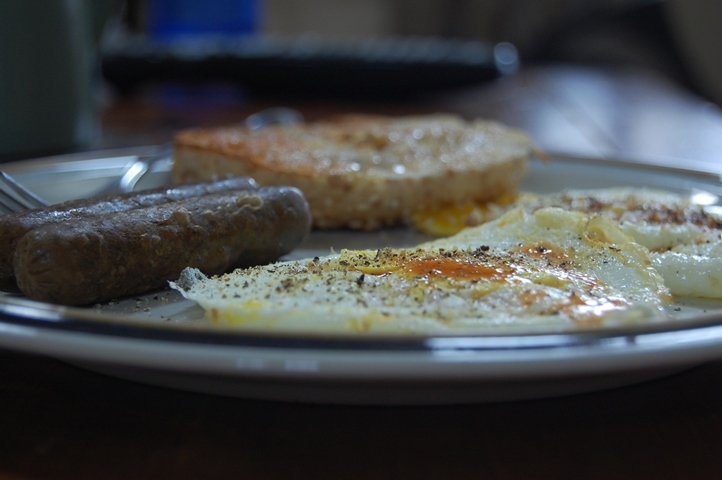 That right there is a smashed fried egg and the sausage looks dipped in a deep fryer. Oh wait, that was the preparation plan? Sorry…. Now, now, the yolk was still runny in the middle. To each his own. I can go OE, OM, OH, scrambled, poached, whatever. “It don’t matter to me…” The sesame bagel was toasted just right with loads of butter. Now to completely make your dog wretch: the links were soy! No pigs had to die. Although I have no issue with them dying. Especially fascist ones. Soy sausages? Soy? Yo no soy sausage, soy capitan. I’ve lost a significant amount of respect over this post. Tell me it was a just a fugue, a passing moment, temporary derangement. You do know that eating a soy sausage in Texas is an offense punishable with a jail term, don’t you? My mom fed them to my son, and he’s crazy about them. I realize the felony level that it is. I thought they might be soy! We bought some the other week when we were serving breakfast for supper and had vegetarian guests. I prefer the soy to the regular–less greasy, more “meat”y. I just hate gristle like crazy. I’ll eat piles of bacon, but I hate picking gristle out. Ick. Over, halfway between easy and medium, kind-of runny but warm all the way through. Yay on the toasted, buttered bagel. No soy sausage, ever. Give me the gristle, Kerbey. We can have breakfast ANYTIME! Just need a big mug of dark coffee. I love soy sausages and real bacon too. Bials: gristle? ick!